video – Latest Venture news. Sick of pausing and rewinding YouTube tutorials to replay that tricky part? Jumprope is a new instructional social network offering a powerful how-to video slideshow creation tool. Jumprope helps people make step-by-step guides to cooking, beauty, crafts, parenting and more using voice-overed looping GIFs for each phase. And creators can export their whole lesson for sharing on Instagram, YouTube, or wherever. 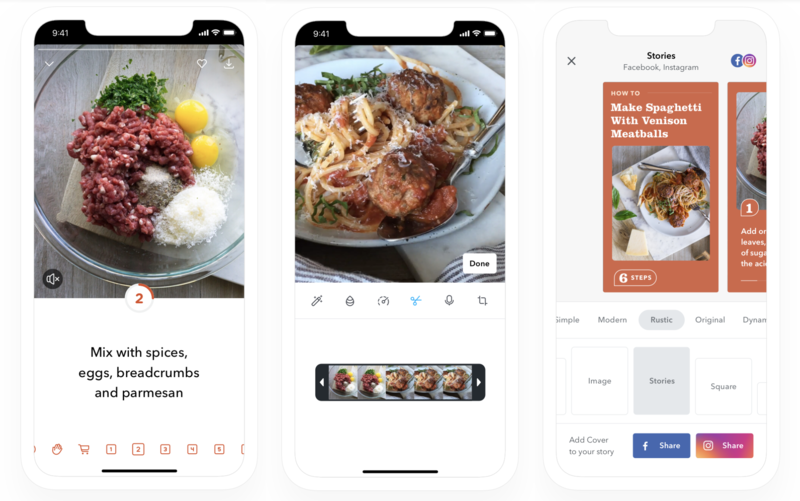 Jumprope officially launches its iOS app today with plenty of how-tos for making chocolate chip bars, Easter eggs, flower boxes, or fierce eyebrows. “By switching from free-form linear video to something much more structured, we can make it much easier for people to share their knowledge and hacks” says Jumprope co-founder and CEO Jake Poses. The rise of Snapchat Stories and Pinterest have made people comfortable jumping on camera and showing off their niche interests. By building a new medium, Jumprope could become the home for rapid-fire learning. And since viewers will have tons of purchase intent for the makeup, art supplies, or equipment they’ll need to follow along, Jumprope could make serious cash off of ads or affiliate commerce. The opportunity to bring instruction manuals into the mobile video era has attracted a $4.5 million seed round led by Lightspeed Venture Partners and joined by strategic angels like Adobe Chief Product Officer Scott Belsky and Thumbtack co-founders Marco Zappacosta and Jonathan Swanson. People are already devouring casual education content on HGTV and the Food Network, but Jumprope democratizes its creation. Poses was formerly the VP of product at Thumbtack where he helped grow the company from 8 to 500 people and a $1.25 billion valuation. He teamed up with AppNexus’ VP of engineering Travis Johnson, who’d been leading a 50-person team of coders. “The product takes people who have knowledge and passion but not the skill to make video [and gives them] guard rails that make it easy to communicate” Poses explains. How To Make A Jumprope. Jumprope lays out everything you’ll need to upload, including a cover image, introduction video, supplies list, and all your steps. For each, you’ll record a video that you can then enhance with voice over, increased speed, music, and filters. Creators are free to suggest their own products or enter affiliate links to monetize their videos. Once it has enough viewers, Jumprope plans to introduce advertising, but it could also add tipping, subscriptions, paid how-tos, or brand sponsorship options down the line. 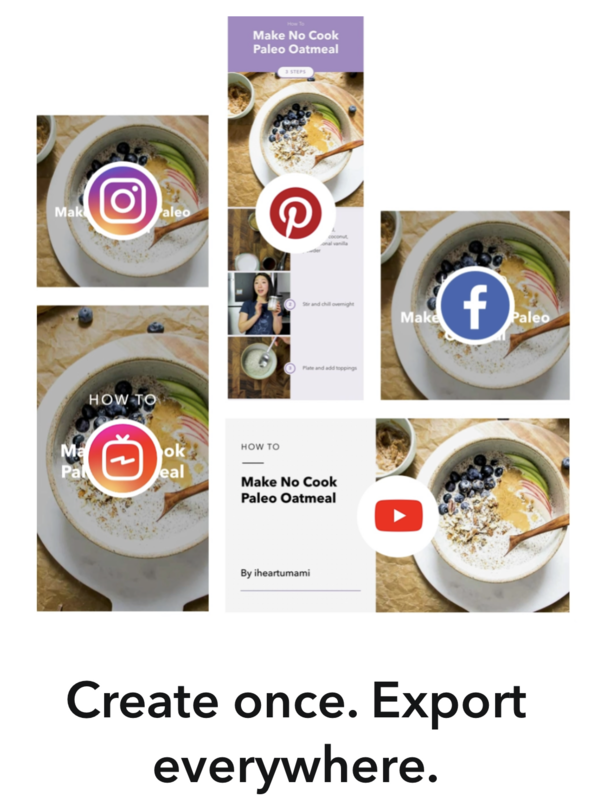 Creators can export their lessons with five different border themes and seven different aspect ratios for posting to Instagram’s feed, IGTV, Snapchat Stories, YouTube, or embedding on their blog. “Like with Stories, you basically tap through at your own pace” Poses says of the viewing experience. Jumprope offers some rudimentary discovery through categories, themed collections, or what’s new and popular. The startup has done extensive legwork to sign up featured creators in all its top categories. That means Jumprope’s catalog is already extensive, with food guides ranging from cinnabuns to pot roasts to how to perfectly chop an onion. “You’re not constantly dealing with the frustration of cooking something and trying to start and stop the video with greasy hands. And if you don’t want all the details, you can tap through it much faster” than trying to skim a YouTube video or blog post, Poses tells me. Next the company wants to build a commenting feature where you can leave notes, substitution suggestions, and more on each step of a guide. Poses claims there’s no one building a direct competitor to its mobile video how-to editor. But he admits it will be an uphill climb to displace viewership on Instagram and YouTube. One challenge facing Jumprope is that most people aren’t hunting down how-to videos every day. The app will have to work to remind users it exists and that they shouldn’t just go with the lazy default of letting Google recommend the videos it hosts. The internet has gathered communities around every conceivable interest. But greater access to creation and consumption necessitates better tools for production and curation. As we move from a material to an experiential culture, people crave skills that will help them forge memories and contribute to the world around them. Jumprope makes it a lot less work to leap into the life of a guru. Ironically, the feature is a tool designed to fact check topics that generate misinformation on the platform. It adds a small info box below videos that provides third-party factual information from YouTube partners — in this case Encyclopedia Britannica. YouTube began rolling out the fact checking “information panels” this year in India and they now appears to be available in other countries. “Users may see information from third parties, including Encyclopedia Britannica and Wikipedia, alongside videos on a small number of well-established historical and scientific topics that have often been subject to misinformation online, like the moon landing,” the company wrote in its announcement at the time. The information boxes are clearly algorithmically generated and today’s unfortunate slip-up makes it clear that the tool doesn’t have much human oversight. It’s possible that imagery of a tower-like structure burning triggered the algorithm to provide the 9/11 information, but we’ve asked YouTube for more details on what specifically went wrong here. This week’s banishment of host Scott Rogowsky was merely a symptom of the ongoing struggle to decide who will lead HQ Trivia. According to multiple sources, over half of the startup’s staff signed an internal petition to depose CEO Rus Yusupov who they saw as mismanaging the company. But Yusupov then fired three core supporters of the mutiny, leading to a downward spiral of morale that mirrors HQ’s plummeting App Store rank. On March 1st, the committee emerged from a meeting and fired three employees who had spearheaded the petition and been vocal about Yusupov’s failings. I sat down with Pär-Jörgen “PJ” Pärson, a partner at European venture firm Northzone, to discuss this at SLUSH this past winter. Pärson – a Swede who now runs Northzone’s office in NYC – led the top early-stage investor in Spotify and led the $35 million Series C in $45/month sports streaming service fuboTV (which has roughly 250,000 subscribers). T-Mobile and Viacom this morning announced a deal that will bring Viacom’s TV channels – like MTV, Nickelodeon, Comedy Central, BET, Paramount and others – to T-Mobile’s new mobile video service planned for later this year. The agreement will allow T-Mobile to offer live, linear feeds of the Viacom channels as well as on-demand viewing. Today, T-Mobile says it still plans to move forward with both its home and mobile TV offerings, made possible by the acquisition of Layer3 TV. The in-home TV service is designed to leverage 5G technology to replace cable. Meanwhile, Viacom will be a “cornerstone launch partner” for T-Mobile’s mobile TV efforts, on track for a launch this year. “Viacom represents the best of the best, most-popular brands on cable, so they are an amazing partner for us,” said John Legere, CEO of T-Mobile, in a statement. “TV programming has never been better, but consumers are fed up with rising costs, hidden fees, lousy customer service, non-stop BS. And Macgyvering together a bunch of subscriptions, apps and dongles isn’t much better. That’s why T-Mobile is on a mission to give consumers a better way to watch what they want, when they want,” he said. Viacom has deals with other carriers besides T-Mobile, having recently renewed its contract with AT&T for DirecTV Now carriage. It also participates in various other streaming services, including its own service (by way of acquisition) Pluto TV, and has invested in Philo. Helping viewers find new people to follow is an area of ongoing interest for the company which has, in the past, faced accusations from smaller streamers who complain they just broadcast to empty channels, and have trouble growing a fan base. During streaming, fans can chat or cheer whoever is in the primary slot – an option they get to choose by clicking on any of the channels’ video player to make in the larger screen. Ads will play only in the primary slot, and viewership also only gets counted when a channel is in the primary slot, Twitch also notes. Zoom, the video conferencing startup valued at $1 billion in early 2017, has filed to go public on the Nasdaq as soon as next month. The company joins a growing list of tech unicorns making the leap to the public markets in 2019, but it stands out for one very important reason: It’s actually profitable. Zoom was founded in 2011 by Eric Yuan, a co-founder of WebEx, which sold to Oracle for $3.2 billion in 2007. Before launching Zoom, he spent four years at Cisco as its vice president of engineering. In a conversation with TechCrunch last month, he said he would never sell another company again, hinting at his dissatisfaction at WebEx’s post-acquisition treatment being his motivation for taking Zoom public as opposed to selling. Zoom, which raised a total of $145 million to date, posted $330 million in revenue in the year ending January 31, 2019, a remarkable 2x increase year-over-year, with a gross profit of $269.5 million. The company similarly more than doubled revenues from 2017 to 2018, wrapping fiscal year 2017 with $60.8 million in revenue and 2018 with $151.5 million. The company’s losses are shrinking, from $14 million in 2017, $8.2 million in 2018 and just $7.5 million in the year ending January 2019. Zoom is backed by Emergence Capital, which owns a 12.5 percent pre-IPO stake, according to the IPO filing. Other investors in the business include Sequoia Capital (11.4 percent pre-IPO stake); Digital Mobile Venture (9.8 percent), a fund affiliated with former Zoom board member Samuel Chen; and Bucantini Enterprises Limited (6.1 percent), a fund owned by Li Ka-shing, a Chinese billionaire and among the richest people in the world. Morgan Stanley, JP Morgan and Goldman Sachs have been recruited to lead the offering. Facebook usage has declined for the first time in a decade, while video-centric apps like TikTok are being touted as the future of social media. Entering this redefined playing field comes Firework, a fast-growing social video app whose clever trick is something it calls “reveal videos” — a way for creators to take both horizontal and vertical video in one shot from their mobile device. Video viewers can then twist their phone as the video plays to watch from a new perspective and see more of the scene. For example, Jeffrey Katzenberg’s mobile streaming service Quibi is pitching its ability to offer an ideal viewing experience no matter how you hold your phone. As Quibi CEO Meg Whitman explained last week in an interview at SXSW, the company has “created the ability to do full-screen video seamlessly from landscape to portrait,” she said. That sounds a lot like Firework, in fact. Firework has filed a patent on its own flip-the-screen viewing technology, which it believes will give creators new ways to tell stories. Besides letting viewers in on more of the action, “reveal videos” also provide an opportunity for things like unexpected plot twists or surprise endings. The way this works is that creators hold their smartphone horizontally to film, and Firework places a vertical viewfinder on the screen so they know which part of their shot will appear to viewers when they hold their phone straight up and down. This recording screen has some similarities to TikTok, as you can stop and start recording, reshoot the various parts and add music. “Snapchat really pushed being vertical only,” explains Firework Chief Revenue Officer Cory Grenier, who joined the company from Snapchat, where he was the first director of Sales & Marketing. “What we see is that most professional filmmakers want to show their work on Vimeo first, and second on YouTube. There isn’t this world where you can really frame the context and the characters of a cinematic story on vertical — it just can’t happen,” he says. Beyond the technology involved with Firework’s new filming technique, the company is also aiming to carve out a space that will differentiate it from other short-form video — whether that’s TikTok or, soon, Quibi. Firework’s videos are longer than TikTok’s at 30 seconds instead of just 15, but far shorter than Quibi’s eight minutes. “Thirty seconds is really the sweet spot between the Snaps that are 10 seconds and something that’s longer-form,” notes Grenier. “Ten seconds is too short to really tell a story. You want to have a powerful opening, a clear middle and a really interesting or unexpected ending,” he says. This format lends itself better to short stories, rather than the remixed, music-backed memes found on TikTok, the company believes. But it also remains user-gen, as opposed to the high production value “TV quality” content shot for Quibi using two cameras. (And a lot more money). Instead, Firework is focused on what it calls “premium user-gen” — meaning it will feature a mix of professional creators and up-and-comers. To date, Firework has worked with names like Flo Rida, Dexter Darden (“Maze Runner”), model and Miss USA Olivia Jordan, Disney star Jordyn Jones, Frankie Grande and others. It’s also working with a handful of brands, including Refinery29 and Complex Networks. But the company doesn’t want to inundate the app with content from brands, it says. In addition to the horizontal-to-vertical trick, Firework is also doing something different in terms of fan engagement: it’s ditching comments. Users can only privately message a video’s creator — they can’t comment on the video itself. “Haters and trolls, they want an audience — they want to elicit a polarizing reaction. We remove that,” says Grenier. And instead of “liking” a video, users can only bookmark the video or share it — an engagement that is styled like a retweet, as the video is posted to your profile with all the original credit intact. Founded less than two years in Mountain View and now relocated to Redwood City with teams in LA, Japan and Brazil, Firework parent Loop Now tested a couple of apps that didn’t find product market fit before launching Firework. Its team of 51 full-time today combines both tech talent and Hollywood expertise. This includes: CEO Vincent Yang, a Stanford MBA and previously co-founder and CEO at EverString; co-founder and COO Jerry Luk, employee No. 30 at LinkedIn and previously at Edmodo; biz dev head Bryan Barber, formerly of Warner Brothers, Universal Pictures and Fox; and CRO Corey Grenier, noted above. The app launched last year and has been in an open beta until now. According to data from Sensor Tower, it has 1.8 million installs on iOS, 55 percent in the U.S.
Firework claims it has 2 million registered users across iOS and Android.